Thinking about getting a shed for your garden? You'll find that there are tons of shed options available to you, and coming to a final decision can be tricky. That's why we've put together a shed buying guide, with everything you need to know to get the perfect shed for your back garden! Obviously, the first concern here is whether or not you actually need a shed at all, and the answer to that is going to depend on what you plan on using it for. Sheds are generally used for storage for anything from bikes to lawnmowers, but you should know that other constructions are an option. 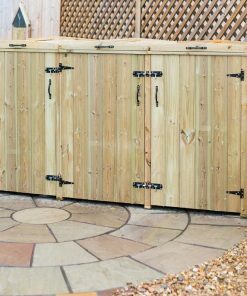 If you're looking to store bikes, for example, there are specifically designed bike storage containers, that take up much less space than a shed. Nasty bins and recycling boxes can go under bin or box covers. 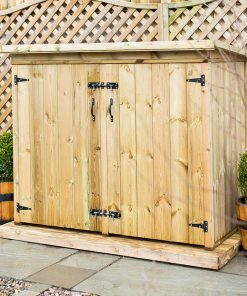 And even if you do have some garden stuff that needs storage, a smaller wooden container may be a better option than a full blown shed. 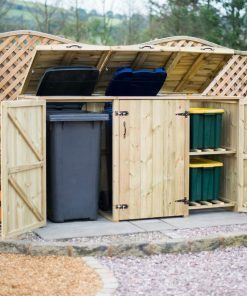 However, if you're looking to store plenty of stuff all in one, safe place, and you have enough room in your garden, then yes, a shed is going to be your best bet. The good news here is that there are sheds of every shape and size, and to meet most budget criteria as well. In terms of size, you'll need to measure the amount of land that you have available to you. Once you know your maximum size, then the best advice is to get the largest shed that you can afford and that will fit. A shed doesn't necessarily last a lifetime, but it will last for a good long time, and you don't want to go through the hassle of getting a replacement just because you've run out of room. If we're talking price, then what you pay is going to depend more or less on two things: size (with bigger being obviously more expensive), and materials (which we'll get to in a moment). You'll need to balance cost versus size, as well as deciding which kind of material is going to be best for you. Plastic: Plastic sheds tend to be the cheapest option, and with new forms of plastic on the market are actually very robust. They're also easy to put together, and light as well. Having said that, the lack of weight can make plastic sheds a little unstable in high winds or bad weather. You may also have the option of adding wood cladding to a plastic shed in order to make it look more attractive. Metal: Metal sheds are extremely robust and secure, and won't suffer from rot as wood may. Generally, you'll get galvanised steel, so you won't need to do any maintenance at all. However, metal sheds can be expensive, and also may be difficult to put together on site. Again, you may have the choice of adding wood cladding in order to make the structure look better in your garden. Wood: Finally, wood is the most common choice, since it's a good compromise between robustness and price. A wood shed is usually fairly easy to put together, and depending on the kind of timber you get can be very low maintenance. With wood you'll also get two further choices. Dip treated wood is cheaper, but you will need to treat the timber once a year or so with a preservative, and guarantees are usually for ten years. Pressure treated does not necessarily need annual treatment, though it is initially more expensive, and will usually be guaranteed for fifteen years. There are two general styles of shed. The more traditional shed is an “apex” style, meaning that the roof comes up to a point (and looks like a triangle from outside). This allows rain and snow to run off easily, but also means that maximum headroom is limited to the centre of the building, with the sides being lower. There are also “pent” roofs. These have a square front and the roof then slopes to the back. The sloped rood still allows for rain and snow to run off, but also means that there is maximum headroom along the front of the construction, which can be easier for storage of things such as ladders. There are also different styles of cladding. The traditional choice here is “overlap” where planks simply overlap on the outside of the shed. Overlap is fine for being weatherproof, but may distort over time. Alternatively “tongue and groove” slots planks together, meaning there's less chance of distortion. “Shiplap” looks very similar to tongue and groove, but is shaped slightly differently to allow a stronger connection meaning better weatherproofing and even less distortion. And finally, “loglap” looks like a log cabin with rounded “tree trunks” fitted together using tongue in groove. This style looks fantastic, and is extra weatherproof and very sturdy (though more expensive). There's no real ideal location for a shed, though it should obviously be somewhere that's convenient for you. You will need to ensure that there is enough room for doors to open properly, and for windows (should there be any). Whether in shade or direct sunlight really doesn't matter. One thing that does matter is standing water though. 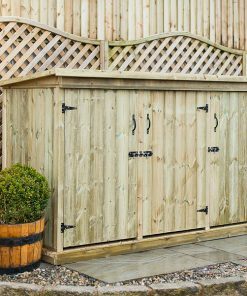 You'll need to place your shed on a level area, preferably one that doesn't catch water or frequently have puddles. Most people choose to place their shed on a platform (of concrete or even bricks) to ensure that water can drain away and won't rot the timber. The ideal shed will fit your garden, both in terms of size and looks, and will store everything you need stored (as well as coming in on budget!). You may also want to think about security, so getting hasps and padlocks, or even full blown keys, is a good idea. Fortunately, a shed is probably only a once or twice in a lifetime buy, so choose wisely and you won't have to go through the hassle of shed shopping again!